Roberta earned a BS in Forest Biology from SUNY College of Environmental Science and Forestry and a Master's degree in Entomology from Cornell University. After serving as a biology instructor at various community colleges, she took a research specialist position with the University of Arizona. She worked closely with the Cooperative Extension Master Gardener program teaching gardening and entomology, and became a Master Gardener herself. She also developed a set of lesson plans about honey bees for the University of Arizona called Africanized Honey Bees on the Move (link goes to the UofA website. More recently, she has been a 4-H leader and taught science to homeschool groups. Roberta is also an inveterate blogger and bibliophile. See her blog about children's books at Wrapped in Foil. For themed lists of science books for children, see Science Books for Kids. Review Policy: Roberta does accept books for review, particularly science and nature nonfiction for children. I am a Mom and educator who is homeschooling my two children. We use the Growing with Science Blog on a weekly basis as a large part of our science curriculum. The materials are diverse, accurate, well written and engaging for the children (and myself). Kudos to you on our favorite science web resource. I love your marshmallow ants and would love to link to it or add it to my site under science. Please check out http://www.classroomtalk.com and if you like the idea let me know! Hi Roberta, Just found your blog! I am a science teacher for children in grades PK - 4, I love all of your science info! Is there anyway to subscribe by email? I added your blog to my RSS Feed but I have over 1000 blogs on that feed & I'm afraid I'll miss your new posts! Thank you & have a great day! If you click on the orange RSS feed button in the right sidebar, under the box where it says "choose your reader" is a blue line that says "Get Growing With Science delivered by e-mail." If you click on that, it will pop up a box for you to add your e-mail. Thanks for your question. I have added an e-mail subscription form in the right sidebar. thank you for the nice work. I was looking for a good pic for Arabidopsis Thaliana and I found one in your blog (http://blog.growingwithscience.com/wp-content/uploads/2015/09/Arabis_thaliana_illustration.jpg) but I was just wandring if it is copyrighted then I can't use it in scietific presentation or my thesis. can you please clarify that to me . 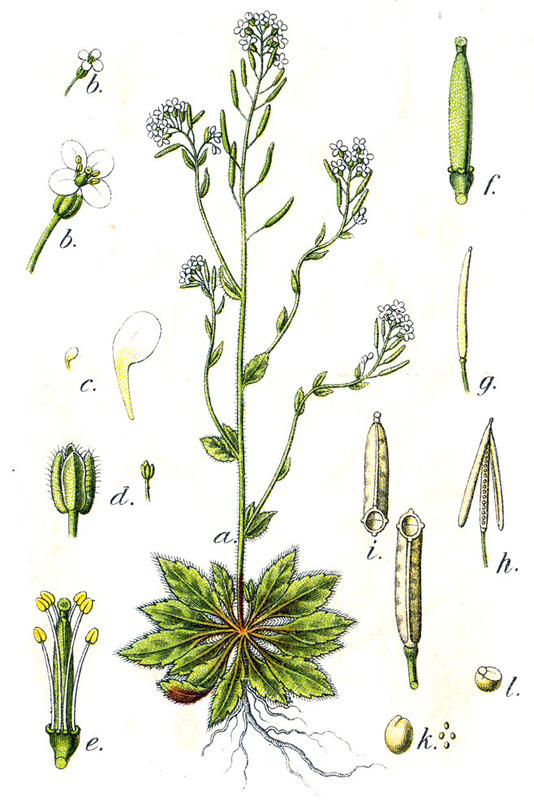 As it says in the post, it is a public domain illustration of Arabidopsis thaliana by Johann Georg Sturm from Wikimedia. Generally these old botanical drawings are in the public domain because the copyright runs out after a certain number of years. Good luck with your thesis.